When you’re just starting to date someone, talking money can feel taboo. And when you begin to talk about next steps like moving in together, getting married or combining financial obligations, finding out that your partner isn’t on the same page as you, credit-wise, can seem like a shock. Add it to the list of serious questions to ask your boyfriend or girlfriend. If you're not exactly proud of your financial history, copping to significant debt can be an emotional undertaking. And if your partner hasn't been forthcoming about something like bankruptcy or debt, this might make you second guess your connection. It's no wonder that money is a top cause of relationship problems. The good news: Being open to talking money, even when it's difficult, is a sign that you are connected and able to work through problems. “If someone is willing to talk about their financial vulnerabilities, it can actually be a sign that they trust you,” notes dating coach Cynthia D’Amour. That said, “Hey, what’s your credit score?” isn’t exactly a romantic line. 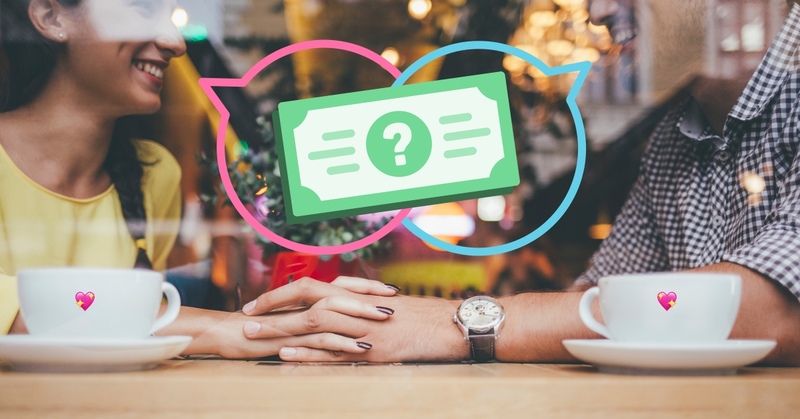 Whether you're in the early stages of a relationship or looking for a financial refresh in your marriage, we found ways to maintain open dialog about money. General conversations about how you like to spend money can help you understand someone's values and open up a dialog about what matters to you. One way to get the convo going is to ask, "If you won the lotto, how would you spend the money?" Obviously, it’s a fantasy question, so you shouldn’t read too much into their answers, but talking about what you would do with a windfall is a good way to introduce the topic of money without putting too much pressure on either of you to talk about your actual cash. It can also be a good jumping off point to explore concepts like charitable giving, family obligations, dream travel and more. Navigating money and relationships can be tricky. Let’s say your partner likes to drop a few hundred dollars on an expensive meal at your regular date night. While the bill may drive you nuts, try to focus on why he values this experience. Is he a foodie? Does he love being in-the-know? Does he want to impress you and show you how much you mean to him through buying gifts? Similarly, ask yourself why this bothers you. Does it say anything about your willingness (or unwillingness) to go with the flow? Is it because your parents were frugal? Is it because you prefer to invest your money? Is it because you feel like you don’t need fancy dinners to cement your bond? Whatever the reason, the more you’re able to pinpoint and discuss the origins of both your feelings, the more you can start talking money in an honest way that helps you move forward. You may be tempted to hide the exact number of your debt, or downplay the financial struggles you’ve had. Don’t. What becomes a deal breaker in many relationships isn’t the number itself, but the dishonesty and lies that might make a partner feel like they can’t trust you. “Omitting information can also be seen as lying, so don’t do it,” says dating expert Bonnie Winston. Try to find an opportune moment to share a bit of your financial history and your savings goals for the future. Let your partner know that while talking money is hard for you and you may want to take time before sharing all the gory details, you want her to understand where you're coming from. Let’s say your partner has some pretty major financial red flags. While it can be shocking, it’s not uncommon. This doesn't necessarily mean relationship problems are in your future. Before becoming too alarmed, you might try to suss out why your partner got into financial trouble in the first place. Was he paying for school? Was she living in an expensive city? You’re not looking for an excuse so much as a sense of whether this type of spending is likely to continue in the future. Finally, look to the future. Does your partner have a plan to pay down this debt (without your assistance)? How will you and your partner align on money goals moving forward? Many couples—even married ones—decide to split their accounts into yours, mine and ours, where both partners put money into a shared bank account to pay for expenses like housing. That way, you can still spend (or pay down debt) independently. If one or both of you are paying down debt, it can be smart to connect with a money counselor or financial coach, who can suggest ways for both of you to approach money and reach your financial goals. Seeing a professional at the beginning of your relationship isn’t a sign of weakness—it is a way to get on secure financial footing to make your relationship even more stable.